Have you noticed that your pet seems to develop jaws of steel when it's time for a dose of medicine? 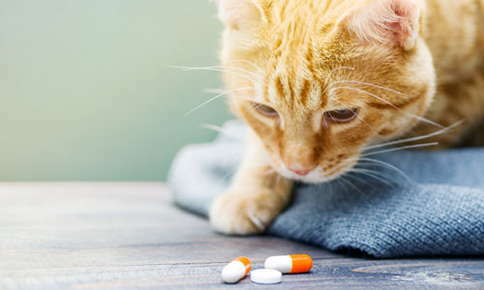 As you struggle to pry apart your furry friend's teeth, you know you only have one chance to drop the pill in his or mouth or squirt the contents of the dropper full of liquid medication. If you miss that chance, the pill ends up on the floor or the liquid drips down your pet's face. Giving your pet medication doesn't have to be a stressful experience for either of you if try a few of the following tricks. Size Matters. Hide the pill or mix the liquid medication in a fairly small piece of food. If you serve your pet a large meal, he or she may never eat the part that contains the pill. Before mixing a medication in food, check with your pet's veterinarian. Some medications are less effective if they aren't taken in their original form. The Stinkier, the Better. Pets can sniff out unusual smells in their food and may reject even favorite treats if they don't smell right. If your pet has foiled your plans in the past, hide the pill or medication in a smelly food, like salmon or a particularly stinky type of soft cheese. Strong food odors will make it easier to ignore that distinctive medicinal smell. Use a Capsule. Consider hiding medications that smell or taste bad in an empty capsule before adding the medicine to food. Once the pill is enclosed in the capsule, your pet won't be able to smell it. Cherry and bubblegum flavors make medications more palatable to young children, but they don't tempt your pet's taste buds. Luckily, compounding pharmacies can add flavors pets enjoy, including beef, fish, chicken, cheese and liver. If the pill or liquid medication tastes good, your pet may accept it willingly. Distract Your Pet. Give your dog a medication-infused treat during a walk or offer a bite of a tuna-encrusted medication while your cat is mesmerized by the birds outside the window. Keep Him or Her Guessing. Your pet will soon catch on if you only offer a certain treat when it's time for the next medication dose. Give your pet a few treats throughout the day to make him or her more receptive when it's time for the next dose of medicine. Take Advantage of Peer Pressure. Other pets don't like to be left out when you're distributing food. Take advantage of your group's competitive nature by offering the entire gang treats. As the patient hurries to keep up with his or her peers, sneak in the treat that contains the medication. Try the Paw Method. Mix crushed pills or liquid medication with peanut butter or any other sticky food, place it on your pet's paws, and watch him or her lick it off. Despite your best efforts, your pet may refuse to take the pill or liquid. If this happens, you'll need to place the medication in his or her mouth. Tilt your dog's head back, grasp the top jaw between your thumb and index finger and pull up. Gently pry the lower jaw open with your middle and ring fingers and place the pill in the dog's mouth, then stroke his or throat to encourage swallowing. Avoid placing your fingers over the sharp, fang-like canine teeth. If you're giving a pill to a cat, place your hand over the upper jaw, then tilt the head backward. Many cats will automatically open their mouths at this point, and you can insert the pill. If this doesn't happen, use your middle finger to gently open the jaw, then deposit the pill near the back of the mouth. A pill gun, a device that shoots the pill into your pet's mouth, is a good option if you're worried that your pet might bite you. Don't tilt the head back if you're giving a dog or cat liquid medication, as this can cause choking. Aim the dropper to the side of mouth between the teeth and the gums. Keep your pet healthy with regular visits to the veterinarian. Contact us to schedule your pet's next visit.